Philip Douglas Jackson (photo ©Keith Allison) was born on September 17, 1945 in Deer Lodge, Montana, USA. In high school, Phil Jackson practiced different sports: basketball, football, baseball and athletics. He went to the University of North Dakota and in 1967 was picked in the second round of the NBA draft by the New York Knicks. A good athlete, over time he became primarily a defensive specialist. When the New York Knicks won the NBA title in 1970, Phil Jackson didn’t play due to an injury that also forced him to undergo surgery. Instead, he wrote a book titled “Take It All”, a photographic diary of that season. Phil Jackson started from the bench in the 1972/73 season, when the New York Knicks won the NBA title again. In subsequent seasons he played as a starter and in 1978 moved to the New Jersey Nets, where he also became an assistant coach, a role he held for another season after retiring as a player in 1980. 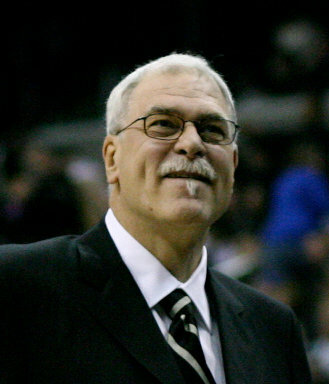 In the following years, Phil Jackson made his first experiences as head coach. In the CBA (Continental Basketball Association) he won the title in 1984 coaching the Albany Patroons. In Puerto Rico he coached the Piratas de Quebradillas and the Isabela Gallitos until 1987. After several attempts, in 1987 Phil Jackson found a job on the Chicago Bulls staff as an assistant coach for Doug Collins. The big opportunity for Jackson as an NBA head coach came two years later, when he took over from Collins. At that time, he met Tex Winter and adopted his triangle offense. In subsequent seasons, Phil Jackson led the Chicago Bulls of Michael Jordan, Scotty Pippen and other players who contributed to the victories to a total of six NBA titles with two “threepeats”: one between 1991 and 1993 and another between 1996 and 1998. Despite the big victories, the tension between Jackson and Bulls general manager Jerry Krause grew over time and in the end the parties came to a showdown. After winning his sixth title, Phil Jackson’s contract was expiring, Scottie Pippen and Dennis Rodman, another protagonist in recent titles, wanted to leave and Michael Jordan announced his second retirement. Eventually, Jackson decided to retire from his activity and initially announced that he’d never coach again. After a year of inactivity, Phil Jackson decided instead to accept the offer by the Los Angeles Lakers to coach Shaquille O’Neal and Kobe Bryant with a group of high level players. Jackson led the Lakers to a threepeat as well between 2000 and 2002. The Hollywood atmosphere also present in the Lakers’s environment brought tensions among the players and between Phil Jackson and Kobe Bryant. Nevertheless, the Lakers reached the NBA finals again in 2004 but lost them. Immediately after the defeat, it was announced that Jackson would leave the Lakers after his request for a doubling of his salary that wasn’t accepted. Phil Jackson wrote a book titled “The Last Season: A Team in Search of Its Soul” recounting the ups and downs of the last season at the Lakers. In essence, Jackson blamed Kobe Bryant for the team’s problems. Nevertheless, in June 2005, Phil Jackson and the Los Angeles Lakers found a new agreement but the level of the team had dropped considerably. In subsequent seasons, the results were limited until the arrival of Pau Gasol, who helped to achieve three consecutive NBA Finals with the victory of those of 2009 and 2010. At the end of the 2010/11 season, after the Lakers were defeated in the playoffs, Jackson announced he was leaving the Lakers again. In March 2014, it was announced that Phil Jackson would become the new president of the front office of the New York Knicks. He hired Derek Fisher – Jackson coached him when he played with the Lakers – as the Knicks head coach, but at least for the 2014/15 season the results haven’t arrived. Phil Jackson is well known even outside the world of basketball. He’s nicknamed the “Zen Master” or “Zen coach” for his philosophical approach to the coaching work and for his love for the novel “Zen and the Art of Motorcycle Maintenance”. He’s certainly not a common person, an expert of mind games who has no problems getting people arguing about him and the environment in which he works.